Columbia Machine will demonstrate the NEW FL6200SW high-speed palletizer with the added functionality of a fully integrated stretch wrapper at the upcoming Pack Expo Show in Las Vegas. The FL6200SW can simultaneously stack and stretch wrap a wide variety of challenging package types including unwrapped trays, shrink pads, film-only bundles and more. The addition of an integrated stretch wrapper helps when load stability or space constraints are a challenge. With the incorporation of servo technology, high speed turntable and high-speed stretch wrapper speeds up to 100 cases per minute are achieved. Columbia is renowned for the industry-leading safety and guarding system that provides “next level protection”. On the FL6200SW, this standard package includes Category 3, Performance Level D safety components and incorporates fully integrated guarding, full height light curtains, automatic four-point hoist pins, case infeed tunnel and interlocked load building area access doors. This safety package keeps your employees safe while still being operationally “friendly” and meeting production demands by providing convenient and safe access when needed. Unparalleled in the industry, the FL6200SW utilizes Columbia’s easy to operate Product Manager HMI, servo-actuated layer transfer and load building area hoists, servo actuated bi-parting apron plates and modular construction that allows for multiple layout configurations to fit your site constraints. Users can effortlessly create and modify layer patterns, view and export production reports, adjust component speeds and timer settings, make stretch wrapper adjustments, and also access manuals and schematics, all through the HMI. Graphic pattern screens can be created at the HMI to aid recovery and provide a graphic representation of diagnostics, improving OEE. 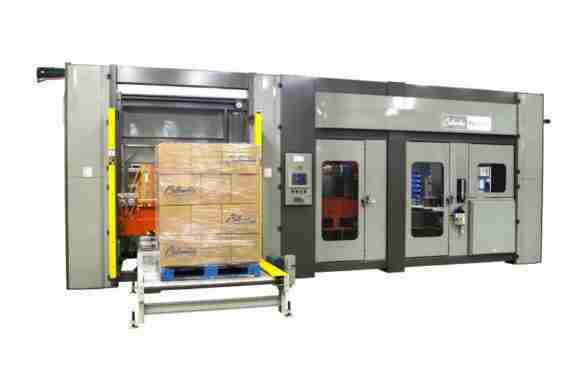 Columbia manufactures inline high speed, high-level, floor-level and robotic hybrid palletizers, load transfer stations and provides complete system integration. Columbia features flexible, upgradeable designs to speeds up to 200 cases per minute. With the broadest and most current product line available, Columbia Machine is the leading palletizing solutions provider in North America. All Columbia palletizers are built in the USA and backed by 24-hour customer support and parts service.